One of the best parts of decorating your house is finding home accents in our home decor store that complement your style and design. But where do you start? How do you know what looks great and what looks tacky? 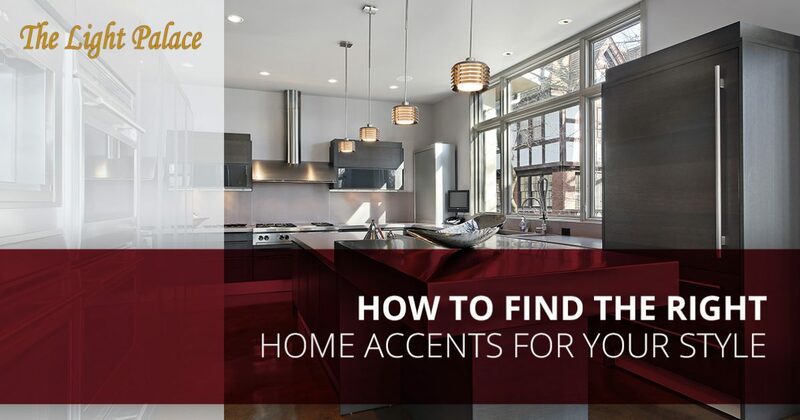 We understand not every homeowner is savvy with interior design, which is why we’ll go over how you can find the perfect home accents for your preferred style in this blog post. The Light Palace is a lighting and home decor store, located in Omaha, Nebraska, and we offer a wide selection of home accent items as well as furniture. We’re best known for our impressive lighting selection, but we take pride in offering more than just lighting products for our customers. We’ve served the local community for more than 50 years, and we have some of the best, most experienced lighting experts in the region. Need unique and trendy home decor for your house? Visit our showroom to see our selection in-person. Contact us today for more information or to schedule an appointment with one of our consultants. Here are some helpful tips for finding the right home accents for your home’s style. This might seem fairly obvious, but the first step to finding the right home accents for your style is to figure out your actual style preference. We encourage you to trust your gut and to genuinely love the style you choose, especially since you’ll be the one walking the hallways of your home on a daily basis. Once you establish a set style, try not to stray away from that style. If you do, the general atmosphere of your home will feel unorganized and disoriented. Now, it’s time to find home accents that fit your preferred style. For example, if your home has a modern or contemporary feel, we suggest shopping for minimalist items with black and white colors as well as sleek, straight lines. Do you still have absolutely no idea where to start? Do you have any questions about what would best match the design flow of your home? Reach out to one of our home decor experts at The Light Palace today. We’re professionally trained in interior design, so you can rest assured knowing we can help you find home accents that will impress your guests. What are you waiting for? Find home accents in our Omaha home decor store that are inviting, one-of-a-kind and that accentuate the details of the rooms in your home. Shop our large selection of home accent items, light fixtures and furniture at The Light Palace today, either online or in-person at our centrally-located lighting showroom. Have any questions for our lighting staff? Don’t hesitate to reach out to us by calling (402) 281-9833 or by filling out our online form.